Danny Rand, the modern Iron Fist; Orson Randall, his Golden Age predecessor, in the background. Daniel Rand is the rich multi-millionaire head of the Rand corporation. He is also the Immortal Iron Fist, a master of Kung Fu, and defender of the ancient city of K'un L'un. Originally a Marvel Bronze Age character, he was first created to cash in on the popularity of Kung Fu films. Iron Fist first appeared in "Marvel Premiere" #15 (May, 1974), created by Roy Thomas and Gil Kane. He appeared as the lead in this magazine until issue #25 (October, 1975). Then was granted his first eponymous series "Iron Fist", which lasted for 15 issues (November, 1975-September, 1977). Sales started to flag in the late 70s, until someone had the great idea to team him up with another low-selling series, Luke Cage: Power Man, as part of Luke's Heroes for Hire agency. The amalgamated series' popularity far outstripped both its predecessors. It was written by Chris Claremont, Mary Jo Duffy, Kurt Busiek and Christopher Priest, who notoriously finished his run by killing Danny. Needless to say, he didn't stay dead — in fact it was Priest who brought him back. Since then he's had an important role during the Marvel Civil War, and even joined the New Avengers. Despite this, he's never really risen beyond B-list status. The character got a new lease on life with the launch of The Immortal Iron Fist, co-written by Matt Fraction and Ed Brubaker (and after their departure, Duane Swierczynski). 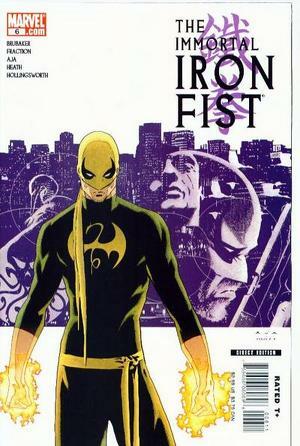 The series reveals that there have been many Iron Fists before Daniel, and introduces a 'new' Golden Age Iron Fist, Orson Randall. In addition there are more Immortal Weapons who represent the other mystical cities of the far east and also wield strange and unusual powers. Daniel discovers new secrets about his past, and must use these to confront former and new enemies. As well as the main story arcs, there are one shot issues that tell the tales of other bearers of the Iron Fist legacy throughout history, and there are several one shot adventures starring Orson Randall. The main run of the comic ended with issue #27, but a short limited series called Immortal Weapons came along soon afterwards, with each issue focusing on one of the other five Immortal Weapons introduced in the original run, alongside a backup story starring Iron Fist. Due to the success of the Immortal Iron Fist series, Iron Fist and his supporting characters have had a surge of popularity, earning cameos and roles in other Marvel comics, video games, and cartoons. Iron Fist has appeared in Marvel Ultimate Alliance 2, The Super Hero Squad Show, Ultimate Marvel vs. Capcom 3, Marvel: Avengers Alliance, Marvel Puzzle Quest, Marvel: Contest of Champions, The Avengers: Earth's Mightiest Heroes!, Marvel Disk Wars: The Avengers, the Disney Infinity series, and the Ultimate Spider-Man animated series, where he is a main character. He even got his own series on Netflix, Iron Fist (2017), tying in with the larger Marvel Cinematic Universe. He is played by Finn Jones of Game of Thrones fame. Amazon Brigade: Tiger's Beautiful Daughter is the boss of one of these in her home town. The Army of Thunder also counts — while Lei Kung the Thunderer definitely helped train them and they get their name from him, every single member of the Army is a woman. Arch-Enemy: Master Khan, whose final storyline and death oddly occurred in an Iron Fist-less arc of Namor (who Khan only went after because he was pissed off that the Sub-Mariner had saved Danny from the H'ylthri). Arrogant Kung-Fu Guy: Davos, the Steel Serpent/Phoenix. Arrows on Fire: It turns out Iron Fists can do this with any projectile weapon. Even guns. Arson, Murder, and Jaywalking: In Immortal Iron Fist issue 5, Danny uses several advanced martial arts techniques with millennia of history that require intense skill to perform, culminating in the comparatively mundane "Brooklyn Headbutt." See also the 'Bronx Sucker Punch'. Awesome, but Impractical: The Iron Fist ability, at least initially. It was too powerful to use on a standard mook as it'll kill him, and left Danny weakened after using his chi. He's gotten better that it doesn't drain him like it used to. "You're a mad dog that needs to be put down... and I have the best kung fu. So bring it." Big Eater: Fat Cobra's appetite as an infant led his parents to abandon him. And then the orphanage that housed him did the same for the same reason; they just couldn't support that kind of hunger. Bilingual Bonus: Chinese writing throughout the pages that always has something to do with what's going on. Boisterous Bruiser: Fat Cobra and Dog Brother #1, who can bring a smile to even Steel Phoenix' grim visage. Brains and Brawn: When he works with Luke Cage, he's the brains to Cage's brawn. Ironic given how clueless Danny can be when it comes to almost anything other than martial arts. Brainwashed and Crazy: During the "Return of the Dragon" storyline, Danny was corrupted and forced to fight the Black Panther. He nearly killed him, but was beaten when the Panther used a radio earpiece to undo the brainwashing. But Now I Must Go: Fongji, the Iron Phoenix, just disappeared after she merged with the Phoenix Force. Calling Your Attacks: The techniques of the Immortal Weapons are named in caption boxes during fights. Canon Immigrant / Channel Hop: The Prince of Orphans is a 1940s Centaur Comics character, John Aman, the Amazing Man, who had fallen into the public domain. Part of why he was introduced was that Iron Fist's 1970s origin was partially inspired by John Aman's origin. Charles Atlas Superpower: Yes, he can use the chi of the dragon Shou-Lao, but his martial arts skills are all his own, learned by studying in K'un-Lun most of his life. Cherry Tapping: Dog Brother #1 once killed a man with a mere "Standard Issue Punch" after slicing his head into three perfect segments but leaving him momentarily barely alive. Chest Insignia: Both Danny and Davos have tattoos burned into their chests from facing the dragon Shou-Lao the Undying, as do most other Iron Fists (though some have the symbol printed elsewhere instead). However, Davos' is a mark of unworthiness, unlike Danny's. The Prince of Orphans also has a chest symbol pledging his allegiance to Lei Kung the Thunderer. Combat Hand Fan: Tiger's Beautiful Daughter uses two of these in her fight with Steel Phoenix. Conveniently an Orphan: Iron Fist loses both of his parents at the age of nine, while on his way to K'un-Lun. Costume Copy Cat: During Civil War, Iron Fist pretended to be Daredevil while Matt Murdock was in prison. Crimefighting with Cash: Zigzagged. Danny's millions have nothing to do with his skills, but on occasion (especially during Civil War and its aftermath), his main contribution to a team is financial. He also paid for the Avengers Mansion so the New Avengers can base themselves there — note, it cost only one dollar, but still. After his return from K'un L'un, his recruitment pitch to Luke Cage was to find out how many street-level problems could be solved by throwing bundles of cash at them. Curb-Stomp Battle: The Prince of Orphans vs. the Steel Phoenix, as a means of punishing Phoenix for his merciless treatment of Tiger's Beautiful Daughter. Darker and Edgier: The Living Weapon series. Deadpan Snarker: While he has his spiritual side and does like to maintain "oneness", he wouldn't be a Marvel superhero if he didn't have an occasional smartass remark leave his lips. Death by Origin Story: To become Dog Brother #1, your parents need to be dead. Dragon Lady: Tiger's Beautiful Daughter is a notable example, being Asian, Stripperiffic, and using handheld fans. There are also many examples in the pulp-inspired tales starring Orson Randall. Dramatic Sit-Down: In the Seven Deadly Weapons spin-off mini, Fat Cobra is an ancient warrior who meets with his biographer. Fat Cobra used chi to live a long life. However, he has amnesia from too much drinking and concussions. During their conversation, he learns just how he became the Cobra Warrior of Peng Lai; he had scores of children with many women. The children grow up and came to get revenge on their deadbeat father. He was forced to kill them and, in doing so, gained enough power to become a Cobra Warrior. Upon hearing this, he burns his biography and dismisses his company. He glares at the fireplace in disgust as he sits alone. Drill Sergeant Nasty: "Iron Crutch" Khan. Eerie Pale-Skinned Brunette: The current Bride of Nine Spiders. The earlier-twentieth-century Bride, when she makes a couple of cameos, does not have this appearance and is much less of a Cloudcuckoolander. Enhanced Punch: Iron Fist's sole superpower (at first) is to charge his fist with chi to make it "like unto a thing of iron." While he eventually gets more powers to go along with his Charles Atlas Superpower, he's generally just a skilled martial artist with an occasional super powered punch. Evil Costume Switch: In the last year or so of Power Man and Iron Fist, Danny switched to a red costume after his guilt temporarily turned him evil. Though this Danny was later Retconned into being a doppelganger, the evil red costume made a return during a Black Panther storyline where Iron Fist was Brainwashed by Chiantang and forced to fight the titular hero. Evil Is Not a Toy: "Incredibly creepy" rather than "evil", but Bride of Nine Spiders' spotlight issue in Immortal Weapons has a group of Westerners finding out just what a bad idea it is to try to summon and bind her, in a story that follows the stereotype of this type of plot. Fan Disservice: Bride of Nine Spiders seductively removing her top... to reveal that her torso is a hollow shell filled with vicious spiders. Fanservice: The Immortal Weapons, with the exception of Dog Brother #1 (due to his heavy armour) tend to wear little clothing when fighting, and the clothing they do wear tends to get torn off. Fat Cobra may not be particularly attractive in a conventional way and Prince of Orphans turns to a cloud when he fights, but both Danny and Davos, as well as Tiger's Beautiful Daughter and Bride of Nine Spiders are fairly attractive people (when the latter isn't releasing the aforementioned spiders, of course), and typically the only clothing they wear is so they're not naked. Fiery Redhead: Fongji, a rare K'un-L'un native with red hair (her mother was a native, but her father was from outside the city). While outwardly very stoic, when she does get angry, there tends to be actual fire. Fights Like a Normal: Especially early on, when using the Iron Fist tired him out much quicker. The Fog of Ages: Fat Cobra has forgotten most of his life, due to a combination of his debauched lifestyle and how crappy and dishonorable much of it was. Fully Absorbed Finale: The original Power Man and Iron Fist series ended with Danny being beaten to death by Captain Hero, and Luke going on the run after being framed for the murder. This was resolved years later in a Namor story arc, where it was established that the whole thing was an elaborate ruse concocted by Master Khan. Great Big Book of Everything: Danny receives a chronicle of the lives of all the previous Iron Fists that only he can read. The Greatest Style: He trained in the mystical K'unlunquan martial arts, which enables Ki Attacks and other superhuman abilities. He is also a master of many other martial art styles. Gun Fu: Danny initially begrudges Orson for using firearms in combat: "You learned your kung fu from Lei Kung and Smith & Wesson?" HeelFace Turn: Davos, through character development, eventually manages to accept that he's been manipulated, and as an extension he's not as smart and skilled as he sees himself as, eventually helping the other Immortal Weapons fight off Xao's forces and helping Kun-L'un rebuild after the Army of Thunder's revolution. Heterosexual Life-Partners: Cage and Iron Fist. Hollywood Hollywood: Setting for one of the Orson Randall tales. Immortality Field: The Eighth City is a brutally hellish realm that could only be reached through a dimensional gateway located in the remotest part of China. It used to be an empty place, until the elders of K'un-L'un turned it into a prison for many demons and monsters that plagued the Seven Capital Cities of Heaven. It's an absolutely dreadful place populated by all evils in the world, where none of its inhabitants are able to age, and they are eventually driven mad by their prolonged stay. Implacable Man: Every Iron Fist is hunted down by one of these once they reach a certain age; very few have escaped with their lives. It Has Been an Honor: Toward the end of "The Seven Capital Cities of Heaven", when Iron Fist and his fellow Immortal Weapons go up against Xao to prevent him from destroying K'un-Lun, he tells them, "Ladies and gentlemen, it has been an honor fighting you and fighting alongside you." Ki Attacks: The titular "Iron Fist" and countless more. Kung-Fu Kid: Pei, Danny's potential successor from the Living Weapon series, and Wah Sing-Rand, the Iron Fist of 3099 from Duane Swierczynski's run. Kung-Fu Wizard: Several of the Immortal Weapons' powers are this. Lady Land: Her Immortal Weapons spotlight issue reveals that Tiger's Beautiful Daughter comes from an Amazonian society where traditionally women fight and men nurture. The Law of Power Proportionate to Effort: Played With. He used to summon his Iron Fist in a very conservative manner due to the stress it caused. That limit has since been removed, however, because it made him rather useless after he began teaming up with stronger superheroes. Legacy Immortality: This is why Iron Fist is immortal; it is the position that will never die, not its occupant. This also applies to the other Immortal Weapons, hence their collective name. Lightning Bruiser: Fat Cobra; taken literally when considering his chi as an external weapon. Luke, I Am Your Father: Danny's father returns in The Living Weapon series as a hulking cyborg who burns down Kun-Lun with an army of gun-toting ninjas. He is absolutely delighted to reunite with his son in the third issue and immediately reveals his true identity. Made of Iron: Danny, as you'd expect from someone with the name Iron Fist. One issue of the 2017 Defenders series has his neck snapped by Diamondback. Properly snapped and everything, without a fake-out. And then the next issue has Danny get right up again and beat the ever-lasting crud out of Diamondback. Mentors: Of many different kinds. Mighty Whitey: Largely played down in the more recent series (with the advent of the other Immortal Weapons and previous Iron Fists, all of whom are Asian), though introducing one of the previous Iron Fists, only to declare him another white guy who out-mastered the masters of K'un-Lun did raise a few eyebrows. My Kung-Fu Is Stronger Than Yours: Shown many times. Danny vs. Davos, Fat Cobra vs. Danny, Bride of Nine Spiders vs. Dog Brother #1, Davos vs. Tiger's Beautiful Daughter, Prince of Orphans vs. Davos (in response to his brutality on the aforementioned fight). Largely the entire point of the Tournament of Heaven. Mystical High Collar: Wore one until recently. Name That Unfolds Like Lotus Blossom: The two female Immortal Weapons, Bride of Nine Spiders and Tiger's Beautiful Daughter. Never Given a Name: The ninja-servant girl (who is Orson Randall's daughter) was never named, due to rather restricted freedoms caused by her society's caste system. According to her, she'll have made a name for herself by the time Danny sees her again. Ninja Pirate Zombie Robot: Some of the Iron Fists weren't content to just be living weapons who got their powers from beating up an immortal dragon. One went off to become a pirate queen, and another merged with the Phoenix Force (after beating it up). No Holds Barred Beat Down: Davos on Tiger's Beautiful Daughter. And in the next round, Prince of Orphans on Davos to demonstrate that such gratuitous brutality is not acceptable in what's meant to be an honourable tournament. Noble Savage: Dog Brother #1. No Name Given: The Prince of Orphans. Until he revealed himself as John Aman. Nonindicative Name: Fat Cobra's totem animal is actually the turtle. Obstructive Bureaucrat: In Bendis' run of New Avengers, Iron Man and the Mighty Avengers confront Danny about his activities with the New Avengers as Iron Fist, which are illegal due to the Super Registration Act. Danny's lawyer, Jeryn Hogarth, points out to Iron Man that Danny is already a registered hero, having registered his fists as lethal weapons. He also points out that, even though everyone seems to know Danny is Iron Fist, no one can technically prove it, except through very unconstitutional means that Tony doesn't want anyone to know about. Jeryn is a pretty pudgy, normal guy, basically telling off some of the most powerful heroes on Earth, and manages to piss off Ms. Marvel. Old Master: Fat Cobra's teacher, "Iron Crutch" Khan. One Steve Limit: A one-off story in The Deadly Hands of Kung Fu pitted Iron Fist against a villain called Steel Serpent. The same pseudonym was later reused for a distinct, recurring character (Davos). Opium Den: Orson Randall suppressed his chi by abusing opium, concealing his existence from those hunting the renegade Iron Fist. Parental Abandonment: Every holder of the title of Dog Brother #1 is an orphan, usually made so by war. Passing the Torch: Orson to Danny. Perky Goth: One of the possible interpretations of the Bride of Nine Spiders. She seems to have a morbid sense of humor, "giggling" ("Che Che Che Che") with delight at the prospect of violence and death (even her own). Power Glows: The power of the Iron Fist causes much glowing. Public-Domain Character: John Aman, the Prince of Orphan. The Quiet One: Fongji, the Iron Fhoenix, said very little, so much so that her mentors actually thought she was mute. Even when it turns out she can speak, she doesn't say much (for a bit of meta-irony, she was created by Brian Bendis, who is known for his characters being verbose). Race Lift: Averted to much debate in the Netflix series after the casting of Finn Jones (best known as Ser Loras Tyrell in Game of Thrones). Retcon: The Brubaker / Fraction run established there was only one female Iron Fist before Danny. In 2012, New Avengers revealed there was one more, about five hundred years ago. Retraux: The Orson Randall one-shots are often drawn in a pulp art style. Retroactive Legacy: Orson Randall and the other 60-some-odd Iron Fists before Danny Rand, established in the Brubaker-Fraction run. Rogues-Gallery Transplant: One of Danny's early enemies was Sabretooth. As in "Wolverine's arch-nemesis, Sabretooth". Salt and Pepper: Iron Fist and Luke Cage. Secret Legacy: Danny didn't know there were Iron Fists before him until the Immortal Iron Fist series in the late 2000s. Additionally, he didn't know his father was almost an Iron Fist before him. Screw This, I'm Outta Here! : While most of the Hydra troops fight to the death or surrender after Xao dies, a small group who were guarding Jeryn Hogarth's mom who had been taken hostage by Hydra give up and run for their lives after Misty Knight threatens to blind one, kill two and castrate the rest. Series Continuity Error: A minor but jarring one. In a flashback eight-year old Danny is seen with Spider-Man action figure... which he could get only via time travel since he and Spidey are about the same age in-universe. Shotgun Wedding: Very narrowly averted — Misty Knight goes to tell Danny she's pregnant, but he proposes marriage to her before she can tell him. She then checks to make sure he hadn't already worked it out. Single-Power Superheroes: At least initially, his only power was "punch stuff." Since obtaining the Book of the Iron Fist, he's learned a Jedi Mind Trick, and it turns out that Iron Fists can empower any projectiles. Spikes of Villainy: A Dark Is Not Evil example, as Bride of Nine Spiders' combat gear includes a collar with very long spikes on it. Her social wear also involves a collar with short, decorative spikes. Stout Strength: Fat Cobra. He's fat, but damn is he strong. Straw Misogynist: During the Fraction/Brubacker run, an easy way to tell when a character is bad is how misogynist they were. Notable examples being Davos and Nu-An, who are both very vocal in their disregard for women, and act extremely abusive towards women they hold power over. This also seems to be somewhat common with previous Yu-Ti, as its said there's only been one previous female Iron Fist, and women are specifically banned from training, until the Army of Thunder's revolution. Stripperiffic: Tiger's Beautiful Daughter's only clothing in battle is belts. Lots of them. She's fully clothed every other time. Superhero Packing Heat: Orson Randall. To Hell and Back: The Eighth City turns out to be a near-literal Hell where Kun Lun consigned a bunch of monsters... and a lot of political dissidents. Too Many Belts: As mentioned above, Tiger's Beautiful Daughter wears literally nothing in combat except a lot of belts, other than a tiny loincloth. Tournament Arc: The Tournament of the Seven Kingdoms arc. Training from Hell: How Danny was trained. Seems to be Lei Kung the Thunderer's standard MO. Two-Fisted Tales: The Orson Randall side stories. Walking Shirtless Scene: Both Danny and Davos, as well as Davos' father Lei Kung (though has some minor covering). Danny often does wear a shirt, but a lot of the time it either gets destroyed, discarded, or had a plunging neckline that exposed his chest, tattoo, and abs. We Have Reserves: How Xao treats his Hydra underlings whp also consider themselves expendable, calling themselves a Legion. "Well Done, Son!" Guy: Steel Serpent/Phoenix. You Kill It, You Bought It: How the mantle of Dog Brother #1 is passed down. Zerg Rush: Part of Bride of Nine Spiders' combat style. Hydra under Xao's leadership operates in a similair matter, simply throwing endless bodies at the heroes which proves rather effective if wasteful.